This beautiful villa rental is located in the peaceful area of Kalafatis, less than 2 kms from Kalafatis Beach, which has both watersports facilities and a diving centre. 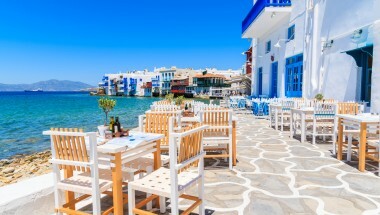 Within 10 minutes drive there are many more beaches, including Kalo Livadi, Lia, Elia, Agrari, Agia Anna, all offering fine white sand and Mediterranean restaurants. 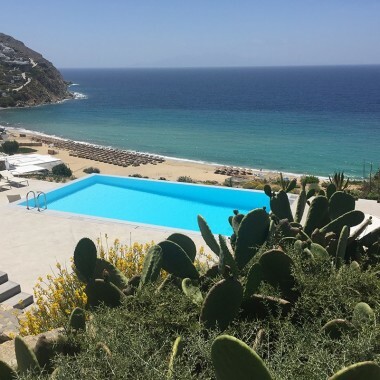 Less than 3 kms from the property is the picturesque village of Ano Mera, with its well-known monastery of Panagia Tourliani and its famous traditional taverns. Also at Ano Mera, guests will find supermarkets, bakeries and ATMs. 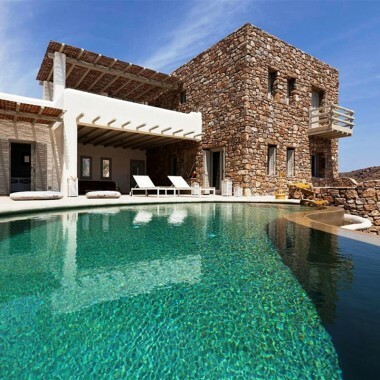 This villa is part of a complex, which combines traditional Mykonian architecture with the luxury of modern conveniences. It is ideal for families, or friends, who want to enjoy the many advantages. The well-designed outdoor area located in front of the villa has a large modern pool and a great outdoor living area around it. Also, there is a built-in BBQ under the elegant wooden pergola where guests can prepare their own meals while enjoying the wonderful sea view. On the ground level is the living room, a full equipped open-plan kitchen and the dining area. On the top level is the master bedroom with private bathroom and its own veranda with sea view. The lower ground level has three double bedrooms, one bathroom, a small kitchen and the laundry room. All rooms are fully air conditioned. 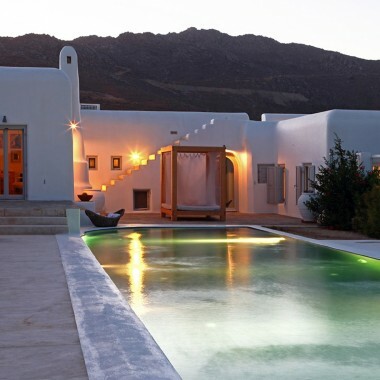 A villa with swimming pool in the peaceful area of Kalafatis, less than 2 kms from Kalafatis Beach, which has both watersports facilities and a diving centre. 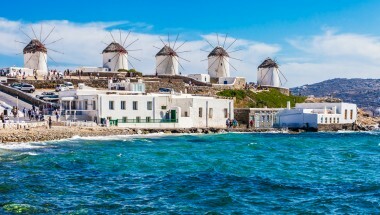 Within 10 minutes drive there are many more beaches, including Kalo Livadi, Lia, Elia, Agrari and Agia Anna, all with sandy beaches and restaurants.